Having a Thanksgiving Meal Planner can help you stay on top of the many details for Thanksgiving dinner. You can be sure to defrost the turkey in time for cooking and manage the cooking times for the various side dishes. My inlaws are joining us for Thanksgiving Dinner this year. While 9 at the table isn’t overwhelming, I like to spread out the tasks on my Thanksgiving Dinner checklist over a number of days. I’m fortunate to have a flexible schedule as a work at home mom; you may need to move some of these tasks around to fit your schedule. This QuadTimer has four independent timers (1 minute-24 hours): all timers may be adjusted, paused, or reset independently. Meaning you can track the time for your turkey, potatoes, green beans, and one more side dish all at the same time. Running timers illuminate in green and flash red when expired. Make room in the fridge for your defrosting turkey. Make a menu plan for the week that relies on leftovers already in the fridge or in the freezer. Talk to your kids about Thanksgiving dinner and your expectations for their behavior. Sometimes kids need to be reminded that certain behaviors like burping or slurping their food are not okay when having guests for dinner. Defrost your turkey. Allow 24 hours for every 5 pounds for a turkey defrosted in the fridge. Wash your linens you’ll be using on Thanksgiving Day. Launder kitchen prep towels, too. Start collecting the serving dishes you’ll be using for Thanksgiving Dinner. I like to stack mine on the dryer in the basement. Also grab serving utensils and put them with the serving dishes. Review your recipes and make sure you have all the ingredients you need on hand. Do your final food shopping. Double check your ingredient list before going. Make a cooking schedule for Thanksgiving. Assign jobs to family members. Assign hosting jobs to family members, too. Write out your menu plan and indicate which dishes are being brought by guests. Call your guests and find out if the dish needs cooking or reheating to be ready for dinner. After dinner, prepare the table(s) for dinner the next day. Use this table setting diagram from Today’s Creative Blog to help you set the table quickly and efficiently. Make sure you put out trivets for hot dishes. Do a quick pick up of the rooms you’ll be using for entertaining the next day. Restock the bathroom with toilet paper if needed. Clear any horizontal spaces you’ll be using for staging dishes. I like to clear off our dining room buffet and set up a warming tray for dishes that need to be kept warm. Do a quick wipe down of the bathroom and set out a towel for guests. Make sure there’s plenty of toilet paper and hand soap. Vacuum the rooms you’ll be using. If you weren’t able to set the table completely Wednesday night, finish setting the table. Make sure you have plenty of towels handy in the kitchen in case there’s an accident. Do a quick review with your kids about their jobs as hosts and their table manners. Don’t sweat it if they forget. 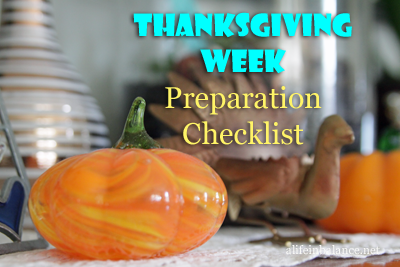 This is a great collection of posts for preparing for Thanksgiving. Thanks for sharing it and I will be sure to print it for later. Have a blessed Thanksgiving, Barb. I bow down to your organizational skills! LOL – I gotta think of everything because something will go wrong! This is a great working list to keep everyone organized! I am thankful that I do not host Thanksgiving. I am quite happy showing up with my pies and whatever else I volunteered to bring and letting my mom stress out LOL. LOL – My dh does all the cooking, but he relies on me for the organizing. I always forget to restock the toilet paper!! I also schedule my cleaning lady for the day before any event at my house, since I work full time it helps so much!! Good idea! I love that you delegate something you don’t have time for and reduce your stress. Now this is a handy tool I could use!! You should make a printable PDF out of it, it would be up in my kitchen in a heartbeat. LOL – Sign up for my newsletter, and you’ll get the list as a printable PDF. Great list! I need to keep these in mind and get started! Can’t wait, I love Thanksgiving! Genius! Thanks for sharing this great list! Great tips! I’m so excited that we are DINING OUT this year! YAY! No prep! Yeah for you! You definitely need the break. Chore buddies! That is a fabulous idea! Love it! It works so well especially if you can pair 2 children who are about 5 years apart. We are traveling to a friends for Thanksgiving this year. After reading your post I’m happy I don’t have to worry about some of these things! LOL – I’m a cover-all-the-bases mom since I have 5 kids and infinite potential for emergencies.